Humidity monitoring is crucial to ensuring the lifespan of wine. Typically, the ideal humidity level is at 70 percent, but up to 80 percent is still considered safe, according to Cellaraiders. Levels below the recommended zone can dry the cork, which will allow air into the bottle and spoil the wine. If humidity is above the optimal conditions, mold and mildew has the possibility of growing and damaging the wine labels. It's traditionally advised to keep bottles out of areas that have a lot of vibrations. These means that zones prone to earthquakes or that have trains close by may not be the best facilities for wine storage. Vibrations have the potential for stirring sediment in wine and preventing them from settling, according to Wine Spectator. This could potentially influence the flavor of the wine, and should be avoided by keeping the wine in a room with a solid floor and placed away from electronics. A temperature sensor can easily allow users to ensure that their wine is kept in the proper conditions. The ideal environment is typically between 50 degrees and 60 degrees Fahrenheit, however, the temperature must be kept constant to ensure the wine ages properly and isn't disturbed, according to Fine Wine Reserve. Once a temperature is chosen, owners must maintain that level consistently with minimal fluctuations as dramatic changes could harm the product. 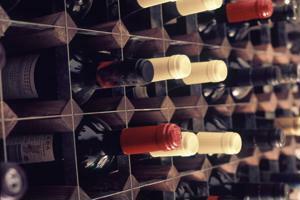 "Temperature stability is the 'holy grail' of wine storage," the source noted. "Besides humidity, it is the most important of the storage requirements, and at the same time one of the hardest ones to achieve." One major shift in temperature can come with the amount of sunlight in any given area. The wine could be degraded or prematurely aged by coming into contact with the sun's ultraviolet rays, according to Wine Spectator. Keeping the product in a basement, cellar or possibly even closet is the best bet to maintaining the wine's clarity and taste. Wine storage can be somewhat complex to maintain in a business or at home, but doing it successfully will help keep the product fresh. Temperature monitoring in wine collection will help users ensure that they can uncork their next bottle and enjoy it without worrying about the quality.